Alyona interviewed Natalie Clay - a college graduate with a debt load of $70,000. and no job. John Turmel interspersed some comments between those of Alyona and Natalie Clay. Jct: Real Caouette said creating jobs was as easy as replacing a bulldozer with50 guys with shovels. Want more jobs? Take away their shovels and give them spoons. It's not jobs that are sought, there are plenty of them needing to be done. It's paychecks that are sought. And how to create money is really how to create jobs. Attached is my video "How banks create money" to explain there are never enough paychecks for everyone to have a job. I've posted a 4-page parsing at my blog. JCT: Youtube doesn't allow links so they'll have to find my blog. What can I do when I hear the pleadings of the sheople who have been taken in by the hunt for jobs when I know the real quest is the hunt for paychecks that create jobs. I parsed Alyona's "I majored in debt" and I hope I haven't been too rough on the kids. 0:40 Alyona: "What it's like being a college grad looking for a job in this economic climate." Natalie Clay (NC) : It's a hunt and I haven't caught anything. JCT: Hunting for jobs instead of hunting for paychecks. JCT: Puts out 5 hooks per day hunting for a bite. 1:20 Bills are piling up and no one tells you as the caps are flying how to survive. JCT: Welcome to the Kingdom of the Paupers where you have to use a LETS software to create your own job through barter and community currency paychecks. NC: I don't know what to do. I'm kind of stuck in this problem. JCT: You signed your "mort-gage" musical chairs "death-gamble" and it's now time to pay the penalty through denial of life- support tickets, poverty. Jesus called it the "alley where men weep and gnash their teeth" when he explained how to fix it. Your priests didn't tell you how to run banking on Earth as it is in Heaven, no loansharking, sad. In those days, the women and children were also seized in the foreclosure with the papa. Alyona: It's interesting that no one ever prepares you for real life. JCT: Of course, they can't teach survival of real life, they'd have to figure out what's knocking people into poverty and teach that it was a death-gamble first. And some people might ask why not switch from the usury charge to the simple service charge. After all, didn't John The Engineer ask the Supreme Court of Canada five times to restrict the banks' computers to a service charge and abolish the interest charge as a panacea for global money shortage 30 years ago? Alyona: Do you ever feel gypped by the education system? 1:50 NC: Obama said we shouldn't be punished for getting educations. News flash, I'm broke and eating noodles. JCT: Join or start a LETS with a restaurant and do his bookkeeping or waitress one night. 2:20 NC: I traded my debt for a degree. The system is setting me up for failure. JCT: That's how death-gamble works. It's set up to generate a certain amount of failure among debtors. Not everyone can escape their death-gamble. NC: I worked hard for 4 years and what did I get? I got debt. I majored in debt and that's not fair because I could have worked at the Dairy Queen but pursuing a higher education that left me $70,000 in debt. 2:53: Alyona: That's not chump change. Are you scared? JCT: On the verge of bankruptcy and starvation, is she scared? 3:10 Alyona: What are your alternatives? JCT: There are no outs from the "death-gamble" contract other than winning a lottery or the equivalent. 3:11 NC: It's a lot of anxiety, stress, I can't sleep because it's all I think about. As the debt piles on and on, I have to find immediate work... I've signed up to donate plasma, and my body, becoming a substitute teacher for $100 a day, temp agencies. I'm living dollar to dollar. I'm being punished for getting an education. JCT: No, you're being punished for signing a usurious contract. If all payments went against principal with no interest with all the time needed to pay, you'd succeed. 3:50 NC: I have so much stress, anxiety, it's really hard. JCT: Welcome to the Kingdom with alleys where we weep and gnash our teeth. 4:05 Alyona: You're not the only one in this situation. The recession is hurting everyone, especially college grads. JCT: Too bad the college grads didn't have the brains to start up their own "College Grad" timebank to offer their services to the world. 4:20 Alyona: What about your classmates? Do they have jobs? NC: No, no one has jobs. JCT: Looking for jobs under the rocks, up in the trees: here jobs jobs jobs jobs. Come here jobs jobs jobs jobs. The futile search for jobs without realizing it takes a paycheck to create a job and maybe trying to create paychecks instead of trying to create jobs is the way to go. 4:27 NC: Or an intern. But those internships aren't paid to get experience. JCT: Rich grads can afford to work for free to get experience as interns while poor kids must can get experience with paid work at Dairy Queen. 4:30 NC: Everyone's in the same boat and we're all sinking together. JCT: The Australia Bulletin called the LETS Greendollar timebank an economic lifeboat a couple of decades ago and it's just too bad Natalie hasn't found LETS Economic Lifeboat in her searches. Of course, she's hunting for a job, not a paycheck which she'd have to create herself. 4:35 NC: The class of 2010, we're on the same boat and it's sinking. I'm drowning in debt and I don't know why. JCT: Because you can't pay the banks 11 when the banks only loaned everyone 10 so there's always shortage and someone must always get knocked out of the mort-gage death-gamble. That's why, and you've got a exponentially growing mill-stone around your slave neck because you're not in the hunt for control over paycheck creation, you're in the hunt for a "job." 4:47 NC: Friends are just as low and down as you are. JCT: Start a self-help LETS timebank to swap skills and at least some of your needs will start to get covered. Set up your LETS lifeboat or drown, sucker. LETS has been called an anti-poverty system, it's been there for your use for years. JCT: So get one of the LETS timebank softwares and use your networking skills to build up your own economic lifeboat. Besides, In 1999, I paid for 39/40 nights in Europe with a timebank IOU for a night back in Canada worth 5 Hours. Do you endorse the UNILETS Millennium Declaration C6 to governments for an interest-free time-based currency to restructure the global financial architecture? is my video "UNILETS Timebank in U.N. Millennium Declaration"
5:00 Friends can only do so much. JCT: If you register how many Hours ($10US = 1 Ithaca Hour) you owe them in public, they and you will feel a lot better about doing more. 5:10 I can't blame it on the economy. I could twiddle my thumbs and blame it on the economy but I have to keep pushing myself and stay positive. JCT: No, it is the economy to blame for not providing enough paychecks for all to have jobs. Or rather, the banksters who run the economy choose to create the unemployed underclass in the alley where we weep and gnash our teeth. You have to quit hunting for a "job" and create yourself a community currency bank to fund your own paycheck for a "job." Laying out hooks in waters with no fish isn't paying off now, and it's not going to get any better. Quit the hunt for jobs and join the quest for money reform. 5:15 Alyona: But who else are you going to blame? JCT: How can Natalie know who's to blame for her not finding a job when she's bears some blame for not helping finding herself a paycheck through community currency, if not federal currency? But the loansharks are to blame. 6:05 NC: Internships should be paid. JCT: Yes, if only you could only hunt up the money. But you're so busy with the job hunt, you never thought of the money hunt so internships could be paid. Okay, I have. 6:30 Alyona: What do you say to the people who also have families and mortgages to pay. Are they more important than you? JCT: Musical Chairs mentality. Who merits survival. Kind of like the "build a home for a worthy slave" shows on TV. Someone's go to suffer the recession, why not you? There's no out from the death-gamble we're all in. 6:45 NC: Not more important because we're all in the same boat. JCT: Yes, nobody's looking for how to create paychecks in the focus on how to catch jobs. 6:48 NC: No matter the circumstances, you have to stay positive. JCT: Sorry, staying positive about a losing strategy is not the answer. Switching strategies from job hunting to paycheck hunting and not why jobs are so hard to find but why paychecks are so hard to find, is the answer. JCT: It's a musical chairs with money death-gamble out there. JCT: The kill or be killed mentality from playing musical chairs for jobs hasn't worked so far. How about creating enough chairs? 7:20 Alyona: Sounds you're going to provide some stiff competition out there in the work force. JCT: Fighting it out over not enough jobs because they don't know they should be looking for the paychecks that create jobs. You kids keep hunting for "jobs" and I'll keep hunting to create paychecks for those jobs even without help from you who are too busy looking for jobs to help look for paychecks. 7:30 Alyona: Good luck in the job hunt. Even though you're sinking, you've got a smile on your face. is my video "How banks create money" if you want to know "How to create paychecks for jobs" and really get a smile on your face. JCT: Anyway, Alyona's a rare sharpie. If she sees the silliness of the invading army that couldn't use the captured railway because the trainmaster had destroyed all the..... tickets, she might see the silliness of not creating jobs because they don't create enough tickets to pay them and save her generation from being like the Great Depression generation to sit down before their trees with hammers and chains saws unable to build themselves housing because they had no money tickets. Ask any person how money is generally created and s/he is likely to tell you that the banks or the mint does it somehow. Ask any person specifically where the money for their personal loan or mortgage comes from and s/he is likely to say that it comes from depositors' funds. Nothing could be further from the truth. It is the signature of the debtor on the promissory note that authorizes the bank to create the principal out of thin air and hypothetize your asset. Such money is created by debt. Banks dont lend money. The money is really created by the borrower who signs the promissory note. Almost all money is created by debt, so if there was no debt there would be no money. The primary way to expand the money supply is to create war. Furthermore, the bank does not create the interest or usury but it exacts such along with the principal from the debtor. Through a process of constructive forgery where neither the debtor (borrower) nor the banker (creditor) bring anything to the table a loan is created whereby you sign an IOU to the bank and the bank treats the IOU as money. You have created new money by a pledge of debt. During the 20th Century the fractional reserve system permitted banks to create and loan $9000.00 when a depositor deposited $1000.00. Fractional reserve banking means that commercial banks were required to keep a specified reserve to qualify them to create and lend mortgages or loans to debtors legally. Governments took away the fractional reserve requirements for most commercial banks during the latter years of the 20th Century. Government relies on taxes and/or borrowing as their prime methods of financing. 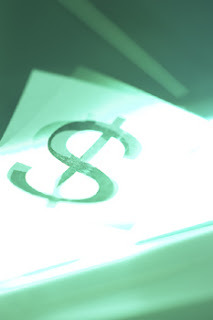 Any government commonly raises funds through the borrowing method by selling its bonds on the open market operations. These government bonds are bought by the large transnational corporations, insurance companies and/or commercial banks. By this government borrowing method to raise funds the taxpayers pay the principal for the infrastructure of highways, bridges or whatever plus the interest or usury costs. Most government funding of this modern era is by this borrowing method and the taxpayer pays the interest or usury to the banks and large corporations for just about everything the government offers, with most taxes giving directly for debt service on the government debt. In summary, the funds of the wage earners are transferred through taxes to the wealthy holders of capital. Even more noteworthy, is the fact that the community must pay more back than it originally received, which of course is an impossibility. There is a withdrawal of currency when debtors pay back their loans. The alternative to this conventional system of money creation through reliance on debt is the action of the government directly investing into the production of consumer goods. The Parliament of Canada has the authority to create and spend the money directly into the economy without an interest or usury cost. In the early 1800's, the small island of Guernsey off the coast of Normandy, France implemented a system of money creation where a direct expenditure was used. The island of Guernsey was impoverished and the population was in decline. The local town council simply issued Guernsey Island paper notes instead of seeking usury-based loans from banks. This resulted in a dramatic improvement in the islands standard of living. Money was issued on road construction and public market and neither inflation nor public debt occurred as the notes were removed by taxes. As we progress into this 21st century, it is imperative that municipal governments study the Guernsey model with a goal to implement such a creative strategy to solve the ever-present shortage of money. The usuryfree community currency movement is likewise positioned to offer resources and expertise on how any municipality can create and spend its own usuryfree community currency. So is there a wing of the church that has not yet sold its soul? Is there a remaining Christian voice against usury, or are Muslims the only people in the world who stand against it? The church must wake up to the truth of our system and become relevant again. This is the civil rights issue of the 21st century, only this time it is not black vs. white but a few money pushers vs. the great mass of users. The power of the bond market is getting ready to wreak havoc. We’re all in it together this time. As Martin Luther King said, “There comes a time when silence is betrayal….That time has come for us today.” Will the real church please speak up?" "On October 25, 2007, the United States announced harsh new penalties on the Iranian military and its state-owned banking systems. Sanctions, bellicose rhetoric and the implicit threat of military action are goads for another war, one that critics fear is more likely to ignite a nuclear holocaust than prevent one. The question is, why is Iran considered such a serious threat? The official explanation is that it is planning to develop nuclear weapons. But the head of the UN watchdog agency IAEA says he has "no concrete evidence" of an Iranian weapons program.1 And even if there were one, a number of countries have tested or possess nuclear weapons outside the Nuclear Non-Proliferation Treaty, including Pakistan, North Korea, India, and probably Israel; yet we don't consider that grounds for military action. Iran would just be joining a long list of nuclear powers. Another theory says the push for war is all about oil; but Iran supplies only 15 percent of total Persian Gulf oil exports, and its oil is already for sale.2 We don't need to go to war for it. We can just buy it. An interesting theory, but it still fails to explain all the facts. In a March 2006 editorial in Asia Times Online, William Engdahl noted that war with Iran has been in the cards as part of the U.S. Greater Middle East strategy since the 1990s, long before Iran threatened to open its own oil bourse.4 And Iran is not alone in wanting to drop the dollar as its oil currency. To curb currency risks, Russia is planning to open an Energy Stock Exchange in St. Petersburg next year to trade oil in rubles, something that will have significantly more impact on the dollar than Iran's oil bourse. Central bankers in Venezuela, Indonesia, and the United Arab Emirates have all said they will be investing less of their reserves in dollar assets due to the dollar's weakening global position.5 When those countries switch to other currencies for their oil trades, will the United States feel compelled to invade them as well? These theories all have some merit, but none of them seems sufficient to explain the war drums. What is so special about Iran? Here is another possibility: Iran poses a serious threat, not only to oil and the dollar, but to a secret financial weapon that keeps a global banking empire in power. . . .
What bankers call the "miracle" of compound interest is called "usury" under Islamic law and is considered a crime. It was also a crime under Old English law until the sixteenth century, when Martin Luther redefined the offense of "usury" to mean the taking of "excess" interest. Modern Islamic thinkers are not averse to a profitable return on investment when it takes the form of "profit-sharing," with investors taking some risk and sharing in business losses; but the usurer gets his interest no matter what. In fact he does better when the borrower fails. The borrower who cannot afford to pay off his loans sinks deeper and deeper into debt, as interest compounds annually to the lender. The debt trap that snapped shut in 1980 was set in 1974, when OPEC was induced to trade its oil only in U.S. dollars. The price of oil then suddenly quadrupled, and countries with insufficient dollars for their oil needs had to borrow them from international lenders. By 2001, enough money had flowed back to First World banks from Third World debtors to pay the principal due on their original loans six times over; but interest had consumed so much of those payments that the total debt had actually quadrupled.8 In 1980, median income in the richest 10 percent of countries was 77 times greater than in the poorest 10 percent. By 1999, that gap had grown to 122 times greater. In December 2006, the United Nations released a reported titled "World Distribution of Household Wealth," which concluded that 50 percent of the world's population now owns only 1 percent of its wealth, while the richest 10 percent of adults owns 85 percent. At interest compounded annually, the debts of the poorer nations can never be repaid but will just continue to grow. It is this debt scheme, with its lethal weapon of interest compounded annually, that has allowed a small clique of financiers to dominate the business of the world. In Tragedy and Hope, Professor Carroll Quigley wrote from personal knowledge of this financial clique, which he called simply "the international bankers." 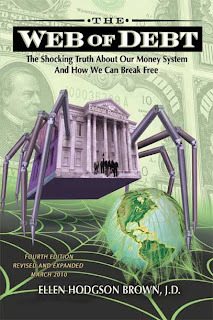 Dr. Quigley, who was Bill Clinton's mentor at Georgetown University, said the aim of the international bankers was "nothing less than to create a world system of financial control in private hands able to dominate the political system of each country and the economy of the world as a whole," a system "to be controlled in a feudalist fashion by the central banks of the world acting in concert, by secret agreements. "9 The key to the bankers' success was that they would control and manipulate the money systems of the world while letting them appear to be controlled by governments. The alternative to this independent "central bank" system is what used to be called "national banking." A state-owned central bank issued the national currency as an agent of the government, and the government spent the money or lent it into the economy for internal development and public needs. The "seigniorage" on this money -- the difference between the cost of creating it and its face value – accrued to the government, which got the money debt- and interest-free. The goal of the international bankers was to privatize this system and bring it under their control. The central bank would still create the national money supply, but it would lend the money to the government, leaving the government with a massive debt on which it owed interest. Once caught in the debt web, the government could then be induced to privatize other assets, making them available for purchase and control by international finance capital. "Do people have to accept dollars or money? No, they don'," Gillie said. "They can accept anything they want or they can refuse to accept anything." Coming on July 13th on NBC25 news at 6 p.m., you'll see why supporters of competing currencies say their money is worth more and is inflation proof. Nowadays, usury is everywhere. It comes with the bank loan you took out for your down payment; it comes with the mortgage on your house and the credit card you are working feverishly to pay off. One way residents of rural Ontario are attempting to combat the pressures of usury is by ascribing to the ways of UsuryFree Networks and incorporating the use of community currency in their towns. Tom J. Kennedy is a retired school teacher and a money reform activist, from Tamworth, Ontario. 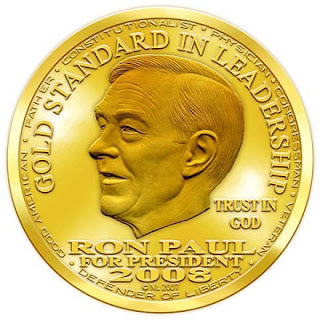 He became interested in usury back in the early 1980's when interest rates had hit 21-22 percent, he explains. “I had a mortgage like everyone else, but I had to ask the question: How come the bank gets two houses and we only get one?” referring to the interest being paid on the mortgage. He calls this problem, “the design flaw of usury” and it relates to the scarcity of federal cash. According to Kennedy, the design flaw of usury is directly and/or indirectly responsible for much of the pain and suffering experienced by human beings living here on planet earth. In truth, we are all paying for usury one way or another. Businesses with debt will often need to increase their retail prices in order to make up for their interest rates, therefore we the consumers are indirectly paying for usury. Rising interest rates cause inflation, which in turn, can cause financial distress for the rest of society. 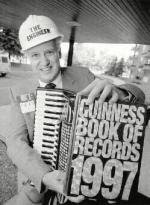 The first usuryfree system was created by Michael Linton, of Comox Valley, on Vancouver Island, British Columbia. Following a local recession in 1982, Linton created the LETS (Local Employment Trading System) sofware. At the time local unemployment rates were roughly 25 per cent and so, the problem was that people had the skills, but there was no one who could afford to pay to use their services. Thus, the LETSystem was born. According to Kennedy, the idea was to make a list of things you have and things you want. Then you negotiate a trade. If you had a large enough group of people, you would be able to survive without an abundance of federal cash. Originally, in Canada, it was all done virtually by calling a system operator and reporting your trade, and then you would be mailed a paper statement, confirming the trade, much like a bank statement. In its first four years of existence the first LETSystem recorded $350,000. Of trading in greendollars that would not have taken place if these participants had relied entirely on hard, federal currency. Since then, LETS has been spreading throughout the English speaking world. Linton called the virtual community currency “greendollars” after his vision of the environmental and social benefits that would follow general use of the system. Now, however, the set up has changed to include printed pieces of community currency to make it easier for trades. “Say you had a product that was worth $100. But the wholesale cost was really $60. In order to trade, someone would pay you the $60. In federal cash to cover your costs, then give you the rest in community currency.” explains Kennedy. - Local people set up a club to trade among themselves, keeping their own record of accounts. - A directory of members’ offers and requests - goods, services or items for hire, priced on local LETS units - is compiled and circulated. - Members use the directory to contact one another whenever they wish. They pay for any service or goods by writing a LETS cheque or credit note for an agreed amount of LETS units, or by exchanging printed LETS notes. - If applicable, the credit note is sent to the LETS book keeper who adjusts both members’ accounts accordingly. - Unlike direct barter, with LETS members can earn credits from any member and spend them with anyone else on the scheme. While the system will work just about anywhere that there are enough people who are willing to embrace it, Kennedy says it seems to work best in rural communities. In Canada alone there are likely about 5000+ people using community currency. Another example of the system at work was in 2001 after the economic crisis hit Argentina. A community currency was created and used by over seven million people. One of the key components of successful usuryfree networks; “is that you take the federal cash you saved by using the network, and you pay off a debt of some kind. It’s the people who really understand the premise of it all that do this. We’re all paying interest on debt,” says Kennedy. Much of the resistance from the general public probably: “comes from the belief that it is a ‘new idea.’ But what most don’t realize, is that our ancestors built our country on a similar system.” says Kennedy. You Are Invited To Launch A UsuryFree Community Currency In Your Community? It is a recession Or is it a depression? It certainly is an economic malaise and it seems to be deepening from a recession to a depression. The silver lining in this dark economic cloud is the simple fact that more and more consumers are now ready and willing to change the way they spend their money. The expressions “usuryfree living” or “living usuryfree” are worthy ideal to pursue. These are simple but positive expressions of our intent to live without paying usury to creditors. It is also the intent of usuryfree creatives to shop locally, with small-to-medium sized retail businesses and/or home-based enterprises where the owner-entrepreneurs agree to accept a portion of any usuryfree community currency as a complement with our diminishing amounts of federal cash. There is an article posted online titled “Life Without Usury.” Simply search for it at any search engine and read it. It is my conviction that this current generation can follow the lead of our ancestors and abolish usury (this time forever) and thereby usher in a new age of usuryfree living for everyone on this planet. The forthcoming “Sixth Annual UsuryFree Day/Week” from November 13th to 19th, 2010 is an optimal time to launch a usuryfree community currency for your local community. There is ample time now to do the research and compile the relevant information needed to facilitate the launch of a usuryfree community currency for your local community. Local trading or exchanging of products and/or services is encouraged and promoted during UsuryFree Week. Committed and potential usuryfree creatives gather each year during UsuryFree Week to share ideas and experiences and engage in networking at workshops and seminars. The pioneering usuryfree creatives are commonly present at these events and willingly share their resources, ideas and experiences with those who attend. A usuryfree community currency promotes the idea of self-sufficiency within any local community. This self-sufficiency concept is otherwise defined as “bioregionalism” and its supporters advocate shopping locally to help re-build the spirit of community. Any group or network that advocates using a usuryfree community currency likewise promotes the concept of “bioregionalism” because the participating traders are re-educated on the importance of buying products and/or services from local entrepreneurs instead of continuing to buy from the big box stores. In general, these giant, transnational, retail corporations are not likely to agree to accept any usuryfree community currency as partial payment for any negotiated trade or exchange because store policy will not permit the sales clerks to authorize such unique, loyalty transactions. However, the local entrepreneur - who is owner of the business - is highly motivated to negotiate trades or exchanges with other participating traders who are seeking to use a usuryfree community currency as a complement with their diminishing amounts of federal cash. Furthermore, the aware and awakened, local entrepreneur commonly views this innovative concept of trade or exchange as the optimal, customer loyalty program. 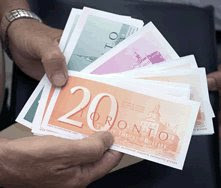 In a manner, similar to the way that Canadian Tire money functions, accepting any usuryfree community currency for partial payment of any negotiated trade or exchange not only brings in new customers, but also motivates them to come back as a regular customer. Indeed, local entrepreneurs like participating in a usuryfree community currency group or network because they know they can spend any usuryfree community currency that they accumulate with other traders in the group, thereby never losing any revenue for their innovative decision. All usuryfree community currencies are commonly referred to as economic tools designed to re-build local economies. A thriving local economy does not require consumers to purchase more and more items. Instead, a local economy thrives when useful and practical products and/or services are exchanged by participating traders within any community. For example, The UsuryFree Network accepts any usuryfree community currency for seminar or workshop admission as well as for various relevant resources (books, brochures, videos, DVD’s, selected health and wellness products etc.) thereby demonstrating how negotiated transactions can facilitate positive and mutually beneficial exchanges between local consumers. UsuryFree Day is the perfect day to ponder our financial impact on our respective local community, but becoming and engaged and committed usuryfree creative is a worthy, longer-term commitment. Seminars and/or workshops exposing the design flaw of usury while promoting the usuryfree lifestyle will be scheduled during this “Sixth Annual UsuryFree Week.” If there is not yet an event planned for your community, you are hereby invited to take a leadership role and plan an event any day from November 13th to 19th, 2010. You do not need to wait for UsuryFree Day/Week to launch a usuryfree community currency in your local community. You can do it NOW In any case, you are invited to resolve to do your part to make the world a better place by commencing your self-imposed course of study by reviewing various, relevant resources to find out how you can experience the reality of usuryfree living in this incarnation. For example, you can go to any search engine and type in any of the following words or phrases: usuryfree living; usuryfree community currency; usuryfree network, usuryfree lifestyle; usuryfree creatives; life without usury; money as debt; Tommy UsuryFree etc. Jennifer Aitkens, writes a regular financial column for Canadian MoneySaver called The Informed Investor. Her column, subtitled 'Print Your Own Money' on pages 5 and 6 of the June 2005 issue of Canadian MoneySaver is reprinted here with permission. I am writing this to you on July 13th, from my computer. First, I want to say how proud I am of your academic achievement at University. Though I did not attend the graduation ceremony I was thinking of you walking across the stage with your peers. On that day, I marveled at you and your generation’s commitment to similar values that my generation and my parent’s generation hold dear: love, honour, justice, fairness, integrity, freedom, prosperity, spirituality, civility, peaceful resolution of conflict etc. As I admired you and all of your colleagues and your professors and the faculty staff of the University, I wondered if it would be your generation that will dare to take up the challenge to formally address the critical issues of war, terror, violence, poverty, scarcity and lack and how these issues can be forever fixed when we expose the design flaw of usury for the evil that it is. I pondered that the .001 percent calculation that is commonly used to measure the general public’s awareness about the design flaw of usury, is likely applicable to the approximate 1000 graduates who received their academic degrees with you. Since you have some exposure to my research about usury, then you would likely be that .001 percenter in your graduating class of 2010. Bravo!! I know that it’s not easy being a young, graduating adult with a debt load caused (a) partly because your father made choices to pursue research as a usuryfree creative and was therefore incapable of giving you abundant financial assistance during your many years of study and (b) partly because your mother and father separated, thereby causing our meagre monthly earnings to be distributed to cover the cost of two households instead of one & (c) partly because you made your own choices of how to spend your loans, grants, earnings etc. and (d) mainly because the ‘system’ is designed to make sure that graduating students of this 21st Century are financially enslaved as they set out to perform their roles and duties for the next 40+ years. What makes the debt challenge even more unique is the fact that you - by association with me - have a reasonable understanding of how the function of usury which will be exacted commencing six months after your final graduation. This usury will cause your debt load to grow exponentially, even though you will be making monthly payments. 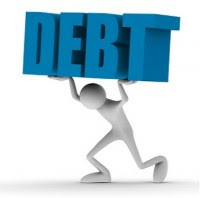 I recommend that you reduce your debt load as quickly as possible to evade the usury fees that the banking institutions will exact from your future monthly pay cheques as you take your place to perform roles and duties for the ‘system’ that relies on new graduates to replace those who retire annually. This means that you must immediately establish your priorities and balance them with your available finances and commit to following a strict budget so that your education debt is paid off as quickly as possible. I admire your tenacity and the way that you and your generation are accepting the challenge to learn how to cope with the vagaries, the hypocrisies and the criminalities of this 21st Century. I extend a sincere invitation for you and your generation to support the research of that unique group of usuryfree creatives (of whom I am one) who have exposed (the problem) - the big lie about money creation and offered (the solution) - a usuryfree time currency for the whole world. When your loans are paid off you can consider yourself a proud usuryfree creative. We, the usuryfree creatives are dedicated to the unselfish, long term goal of experiencing usuryfree living for the whole planet rather than the selfish, short-term goal of experiencing usuryfree living for oneself. Make no mistake about it. We are in an Information War and it is not just about abolishing usury within your personal lifestyle. It is about knowing of the desire of the usury elitists (politicians, global bankers and their corporate cronies) who have hijacked most governments in the world to create permanent financial slavery - locally, nationally and internationally. They have an ultimate agenda to forever enslave us within their usury-based system of electronic finance enforced with police-state repression. They refer to it as their New World Order, I refer to it more correctly as their New World Dis-Order. They are advancing their agenda at a rapid rate. The Bilderbergs met in Spain during the first week of June 2010 and the G8 and G20 met in Toronto, Ontario during the last week of June 2010 to further advance their devious plans - certainly not for we-the-people. Indeed, the outcome of this current Information War will shape Canada’s future, America’s future and the world’s future for the 21st century and beyond. Indeed, the stakes are that high. If we want to preserve and defend the Constitution of Canada, and the best of what we are in the world, and if we want to help advance humanity another couple of feet along the route to civilized behavior instead of falling back into the old habits of violence and repression - if we truly desire that future, we can make it happen with soul force and re-education that begins after you complete your formal education. Emile Zola said of truth: If you shut up the truth and bury it under the ground, it will but grow, and gather to itself such explosive power that the day it bursts through, it will blow up everything in its way. As we progress into this 21st Century, the 'truth about money' is being revealed in ways that resemble the spread of an epidemic. 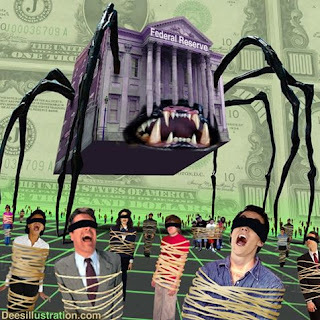 People are awakening to the fact that a network of 'high finance' money lenders dictatorially control the wealth, the citizens and the destiny of nations worldwide through a centralized banking process enforced by usurious monetary laws. A careful reasearch of history indicates that the Federal Reserve Act (USA) of 1913 was passed through the intrigues of these international bankers in order to finance World War I and commence the financial enslavement of the citizens of the western world. There is much evidence to show that the Great Depression of the 1930's was systematically planned to consolidate the plunder and power of the international bankers. And now in this 21st Century, the compounding burden of personal, business, national and international indebtedness has brought the world to the brink of global financial collapse that will leave millions of people destitute and dispossessed - unless we build our economic lifeboats NOW. While most people are not yet aware of the power of the international financiers, the ranks of the enlightened are growing daily. The global banking industry must be understood for what it really is and not for what it is perceived to be. The objectives and hidden agendas of these global bankers must be thwarted and their injustices redressed. This requires the presentations of knowledge by those who have already learned the realities of international finance. The banking industry, the transnational corporations and the politicians are but individual facets of the collective power structure of national and international finance. All facets of this power must be confronted and intellectual abdication is a luxury that cannot be afforded. The Revolution of Understanding must be accelerated. A new Intelligentsia must be created to bear the light of truthful concepts about usury or interest and how it affects our orthodox money system. Usuryfree living is becoming more than just a dream for people who are re-educating themselves on financial concepts that formal education neglects to teach. In fact, usuryfree living is becoming a reality for those usuryfree creatives who are putting into practice the knowledge that they are learing from their self-imposed, re-educational courses of study. Viral marketing and viral advertising by usuryfree creatives within the usuryfree community currency movement can take the credit for the growing awareness of the reality of usuryfree living. The new element about usuryfree living is that people are becoming aware of how they have been victims of the design flaw of usury and they are now empowering themselves to make a difference. The most staggering truth that absolutely baffles most people is the fact that banks do not lend out depositors' funds. Instead, banks act as the 'creditor' by creating and lending brand new money (the principal) based on the borrower's (the debtor's) signature on a promissory note. People of our parents' and grandparents' generations instinctively managed their money and financial transactions to avoid paying usury and/or to pay minimal amounts of usury without being aware that banks were involved in a sleight-of-hand process in regards to money creation. In recent years, it has become very clear that debtors have become pawns in the games of global banking and political power. These debtors are the small to medium-sized businesses and the family farms as well as those middle class families who have mortgages on their family homes. It is the aim of the super rich money lenders of the world banking cartel to check-mate all of the small to medium-sized businesses and family farms and so that we will be subservient to transnational corproations and large agri-business corporate farms. Unknown to most of the debtors, it is the design flaw of usury (interest) along with the fraudulent practice of fractional reserve banking that is the rampaging, deadly cancer that has been destroying and weakening our economy so that we will have the status of a third world country. Will we awaken enough of our fellow-citizens to save ourselves or will we continue on the road to total financial enslavement by the New World Order advocates? During the latter half of the 20th Century and continuing to the present, just like any marketable concept - 'Buy Now, Pay Later' - was and still is foisted upon two unsuspecting generations, baby boomers and their children. As consumers, the baby boomers and their children are bombarded with an 'immediate gratification' mentality by radio, TV and print advertising and credit cards are pushed at the youth even in their teens. For the past 40 years bankers have been using with great success, the age-old 'bait and switch' con game on consumers who are ignorant of money creation. It's about time that consumers - the baby boomers, their children - and their children's children - learned that bankers create money by the stroke of a pen with a hidden agenda to 'snare' as much collateral as possible. Informed consumers will stop trusting bankers when they learn the truth about money creation. The expected norm of carrying credit card debt has mushroomed into a multi-billion dollar business during the past 40 years. More people than ever before are placing second and/or third morgages on their family homes to pay off usurious, credit card debt. Enter the usuryfree LETS (Local Employment Trading System) software in the early 1980's and those who participated learned that they could create and spend their own usuryfree community currency in these mutual credit systems known as LETSystems. Ironically, this new-found status of abundant money creation was birthed because of a 'shortgage of money' in the early 1980's when interest (usury) rates skyrocketed to 21% in Canada. For the past 26+ years, the usuryfree community currency movement has been evolving with the introduction of hybrid usuryfree currency systems that utilize paper notes of usuryfree community currency. The usuryfree community currency movement is shifting us away from cenralized 'dollar and cents' banking towards decentralized 'hours and minutes' banking. 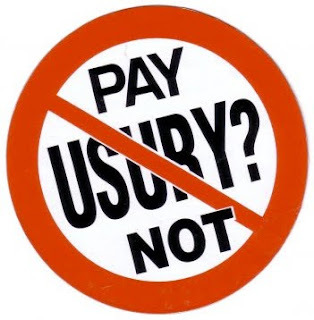 Given the ease of modern technology, we can abolish the usury software that currently dominates the infrastructure (hardware) of the orthodox banking system and replace it with a usuryfree software modelled after the original usuryfree LETS software. During the 1980's two-income families emerged as the norm and both spouses in a marriage were conditioned to scramble on the economic tread-mill in a frenzied effort to earn enough money to pay the ever-increasing amounts of 'usury and taxes.' Few people realized that most taxes payments are directly and/or indirectly exacted as usury by the orthodox banking system since all levels of government as well as all corporations have loans from creditors that exact interest or usury, otherwise known as 'debt service.' What to do to solve these problems? That's where the UsuryFree Network comes in. The UsuryFree Network offers workshops/seminars to individuals and/or groups along with an abundance of resources such as audio cassettes, video cassettes, DVD's, CD's, websites, books and printed literature. 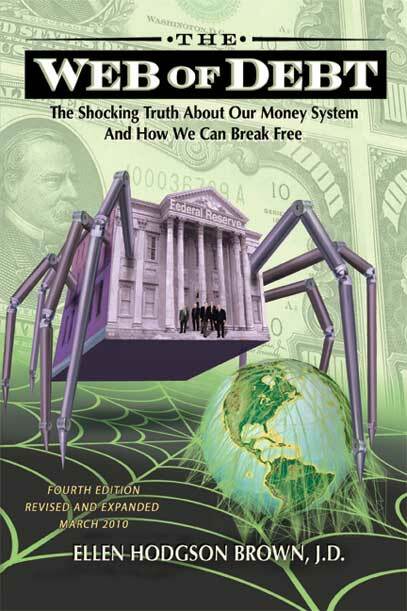 'Money As Debt' by Paul Grignon, is the newest and most popular DVD that is now available from the UsuryFree Network. The UsuryFree Network was launched on May 13th, 2001. 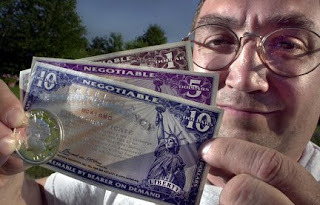 The UsuryFree Network launched a usuryfree community currency in Tamworth, Ontario, Canada on November 13th, 2004. To honour the first anniversary of Tamworth Hours, the first annual UsuryFree Week was declared to be from November 13th until November 19th, 2005. Events were celebrated in Tamworth, Ontario, Canada on November 13th, 2005. The sixth annual UsuryFree Week is scheduled from Saturday, November 13th until Friday, November 19th, 2010. Events will be planned for various communities during UsuryFree Week. The UsuryFree Network invited usuryfree creatives to plan local events and share the details with the UsuryFree Network. Together we rely on viral marketing and viral advertising to network and promote these events so that more people can learn how to avoid and/or eiminate usury in their economic lives. Sharing news about plans to launch a usuryfree community currency in your respective local communities is advocated as one of the best ways to celebrate UsuryFree Week. The dream of becoming usuryfree and thereby eliminating usury in this incarnation motivates people to step out of their 'hassle-free zones' to re-educate themselves and over-ride the lies, deceit and deception that has been foisted upon them by the media and their formal education experiences during the latter years of the 20th Century. The UsuryFree Network reports that individuals freely admit that after being exposed to this new information, they may choose to ignore this re-education, but they can never unlearn the 'truth' once exposed and confirmed by their own ongoing research. Consultations offered by any usuryfree creatives being re-educated by the UsuryFree Network are definitely worth implementing and individuals are encouraged to become self-motivated in a world where usuryfree creatives are still a minority and the dream of usuryfree living is a reality yet to be realized by the masses. Understand that when usuryfree living is experienced, and usury is eliminated from your life experience, you will truly enjoy 'heaven on earth.' Indeed, usuryfree living is empowering and it is right for you. When you are ready to commence the process of 'becoming' usuryfree consider attending or planning a usuryfree workshop/seminar hosted by the UsuryFree Network and make it an event that will transform your life. Below is a good article by Keith Johnson re-posted from his blog - where he has many other good articles as well as links to many other relevant and informative websites. "As the Great Depression of the 1930’s was getting underway, President Herbert Hoover refused to acknowledge it. In the weeks following the events of Black Tuesday, Hoover called the economy “fundamentally sound.” Months later, he still insisted that the strength of the American economy was “unimpaired.” However, by 1931 he could no longer hide the truth. With the economy in shambles, Hoover was forced to declare that America was indeed in a ‘depression’. He chose the word ‘depression’ because he believed it to somewhat innocuous and far less provocative than terms like ‘panics’ or ‘crises’ that had previously been used to refer to significant economic downturns. The lies propagated by our government and their paid shills are perhaps their greatest crime. Deceiving the people concerning the scope and magnitude of our financial crisis denies them the opportunity to prepare for the tough days ahead. Even the word depression does not fully impress upon the people the serious predicament we now face. Perhaps its time we do remind people of the 1930’s and draw parallels between those tragic times and our current situation. Today’s unemployment rate is fast approaching the worst levels seen since the Great Depression. The official unemployment rate (U3) released by the Bureau of Labor Statistics is currently at 9.9%. This is the number often reported by the mainstream media for public consumption but is far removed from reality. To get closer to the real number we must consult the (U6) figure that is often touted as ‘true unemployment’. This figure adds into the equation those who fall under the contemporary definition of ‘discouraged worker’ and those who can only find ‘part-time’ work. That number puts the ‘true unemployment’ rate at 17.2%. But wait, there’s more! Today’s definition of a discouraged worker is one who has not found work within the last year. Prior to 1994, a discouraged worker was defined as one who had not found work within the last month. That’s a big discrepancy. If we add those lost souls back into the equation, we come up with a more realistic unemployment rate of right around 22%. That’s just three clicks shy of the 25% often cited for the worst levels of the Great Depression in 1933. That 25% unemployment figure was reflective of all workers both on and off the farm. Many economists, intent on disproving any comparison of today’s unemployment with that of the ‘Great Depression’, will often cite the non-farm unemployment figure of 34%. But it should be pointed out that during that time, 27% of America’s employed worked on the farm. Today that number is only 2%.